Cook this simple , delicious super quick Saag paneer / Spinach with cottage Cheese recipe. It is a healthy, delicious Spinach /Saag salt and red chili powder recipe. Serve the Saag paneer / Spinach with cottage dish with roti or parathas. Wash well spinach / palak saag and drain it. Chop spinach/ palak saag finely and keep aside. In a wok / jadahi / heavy bottom pan heat oil , add Asafetida / hing powder sauté until light golden brown. Add chopped spinach, salt, chili powder , cover and cook on low flame for 8-10 minutes till spinach / palak saag is cooked. 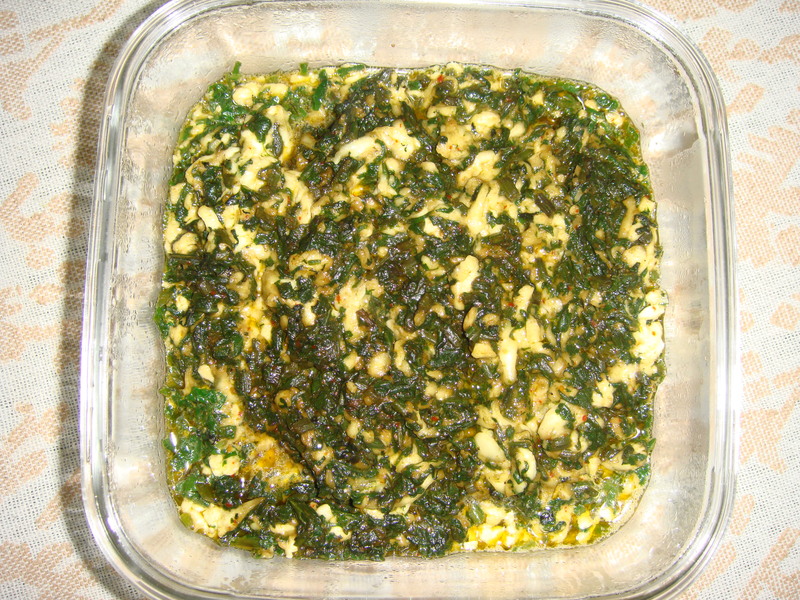 Grate cottage cheese / paneer add it to the spinach / palak saag , mix and cook on low heat for a minute more. Serve hot with Indian breads of choice ! What is Cottage Cheese/ Paneer? Cottage cheese (paneer) is a mild flavored cheese curd dairy product that is prepared from loosely packed cow’s milk. It is prepared by allowing milk to curdle and then draining it almost completely. The milk is curdled by adding lemon juice, vinegar or chemical enzymes. Milk goes bad quite often and curdles naturally. In such cases too, people often use the curdled milk to prepare cottage cheese. It is not pressed after draining however, so the curd that is retained is not compact. This curd that is left behind is then washed or rinsed out to get rid of the acidic content that is normally present in curd. The product that is left behind is a sweet curd cheese. Cottage cheese prepared in this manner has a bland and mild taste, making it a great addition to various types of food as it brings out the flavor in other ingredients. Cottage cheese can be found in different styles and may differ slightly depending on the different types of milk that it may be prepared from, with different fat levels or there may also be some variation because of the method of preparation. Cottage cheese may also be sold as chunks, not in the loosely packed curd form and this kind of cottage cheese is produced by pressing cottage cheese to get rid of all of the whey. Like milk, cottage cheese is a perishable food and should be consumed within a week to ten days of preparation. Something about paneer: Paneer is a fresh and delicate cottage cheese made from whole milk in India. Paneer is rich in nutrients and making it involves long and complicated procedures. Cottage cheese is often thought of as a dieter’s food because of its nutritional profile. It certainly is a healthy food and is often seen as such because of its high protein and calcium content and low fat content. It is also a good source of numerous other nutrients and is extremely easy on the digestive system. Protein Rich: Cottage cheese is a great source of protein and it’s not surprising that most nutritionists recommend the inclusion of cottage cheese as an important ingredient in almost any vegetarian diet. The exclusion of meat from your diet significantly affects protein intake and increasing cottage cheese consumption is one of the best ways to offset this lack of protein in the diet. Just one cup of cottage cheese (226 gm) will give you 28 gm of protein. This means that it will give you 56% of required daily intake of protein. Most of us are well aware of the importance of protein, but we often tend to regard it as not entirely necessary. However, this couldn’t be less true. As one of the essential nutrients, protein is absolutely vital for our health and wellbeing. Protein is especially important for bodybuilding, fitness and sports enthusiasts, as protein is essential for muscle growth and repair. It is also extremely important during pregnancy, as protein drives fetal development and brain growth. Diabetes Friendly: Cottage cheese is low in carbohydrates and high in protein, making it a great addition to any diet for diabetics. It is even listed as a healthy food choice by the American Diabetes Association because the low carbohydrate content and protein dense food ensures that energy is released into the body slowly, without causing any of the spikes in blood sugar levels. This also means that unlike certain high energy foods it doesn’t just give you a sudden burst of energy that peaks and falls just as quickly. While a cup of cottage cheese gives you 28 gm of protein, it contains just 6 gm of carbohydrates. Satiating: The low-carb and high protein profile of cottage cheese also makes it a great health food for anyone with a weight problem that stems from overeating or from snacking on unhealthy foods. The slow release of energy from this protein dense food ensures that you get adequate energy without the sudden bursts in energy levels characteristic of other high energy foods. This makes it a good addition to your diet as a ‘between meal’ snack to satiate your hunger and prevent you from binging on junk foods. Skeletal and dental health: Cottage cheese is also an excellent source of calcium making it a healthy food choice for everyone. While problems like osteoporosis that are associated with calcium deficiency or inadequate calcium intake usually set in later in life, calcium intake during childhood and youth has a considerable impact on bone health later in life. Try and include more cottage cheese in your diet, especially if you don’t consume much milk and other milk products. Weight Loss: Cottage cheese is also a great source of conjugated linoleic acid or CLA. CLA forms when the chemical composition of linoleic acid gets altered by bacteria. There are claims that CLA offers a variety of health benefits such as increasing body metabolism and promoting weight loss, cholesterol lowering effect and cancer risk reduction. Unfortunately, most good sources of CLA like beef, lamb and veal also contain excessive amounts of fat. Butter, another source of CLA is also high in saturated fats. Cottage cheese is therefore a healthier source of CLA, especially if you are a vegetarian. Keep in mind, that none of these claims about the efficacy of CLA have been substantiated with evidence so far.